I haven't gone to Sunday School this year, a feat made easier by the fact that we only have Sunday School twice a month now. I missed the first week of Sunday School because instead I taught (and, uh, maybe lost) Sunbeams. I missed last week because Zoë was too sick to go to her class so I took her home instead (and then I also packed for my weekend trip to Idaho because I'd forgotten to do that the night before). She's now getting over her croupy cough and hasn't had a fever since early this week (though she also missed preschool on Wednesday, which was bitterly disappointing (though was made sweeter when her friend Hannah dropped by some cupcakes to help her feel better)). Naturally Alexander is croupy now, running a fever and barking that iconic seal-like cough. He's so sick and miserable that everything he does is 100% pathetic and sympathy-inducing. "Momma!" he'll moan, and he gets Momma. He moaned a new word this afternoon, "Banana!" and he got a banana. Basically whatever he wants he gets because everyone feels so sorry for him. Our pity is heightened, I think, because on top of being cute and small and sick, the poor boy has a black eye! 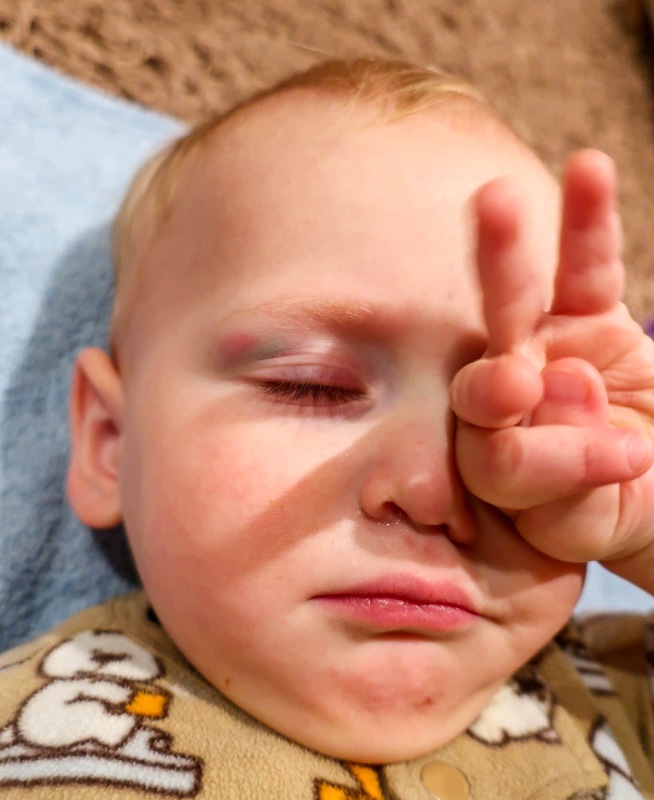 He was climbing onto the table yesterday (nothing can keep him down if there's something to be climbed, not even croup) and he slipped and somehow hit his eye right on the corner of the bench...or the table...? I'm not sure exactly what happened. I just scooped him up and cuddled him while he wailed, "OW! OOOOWWWW! OW!" because he's a comic book baby like my brother Patrick was and makes the exact sounds that would appear inside the speech bubbles (ow, achoo, etc). "Oh, sweet baby," I crooned, holding him against my shoulder and dancing him around. "That was a big fall, but you're going to be..."
It was then that I looked at his face for the first time. "Alriiii...oh!" I gasped in horror. His poor little eye was sporting an angry purple welt. My poor baby! By lunch his poor eye was quite purple and then for whatever ghastly reason, Zoë reached over and poked his good eye, so he was sitting in his highchair with one eye swollen and purple and the other eye red from being jabbed and both eyes burning, I'm sure, because he's sick (Zoë complained about her eyes when she was sick so I'm sure his eyes are hurting, too). It was so pathetic. Today his eye is looking better; his bruise is a tri-coloured splash of rainbow on his eyelid (pink and purple and green) but the swelling has gone down a lot and it doesn't seem to bother him too much. The big kids had fun recounting all of Zoë's black eyes (they had a debate about who was younger when they received their first black eye: Zoë or Alexander). It was Zoë, at 13 months, courtesy of Benjamin (and then Zoë at 23 months, again courtesy of Benjamin; and then Zoë at 2.5 after running into the counter at Auntie Emily's house). I think Alexander wins for the biggest bruise, though Zoë still has a little scar from being hit with the water gun (at 13 months) and a rather big scar from running into the counter (she probably should have had stitches for that one). I don't think Alexander will have any lasting battle scars from his encounter with the bench...or table...whichever it was.